We went shopping last week for a birthday cake for Mini Me's big day yesterday. He originally wanted a yellow cake with Funfetti frosting. Then he decided he wanted a chocolate cake with a yellow layer of cake on top. But when we got to the store, he saw the new Duff Goldman's Tie-Dye Cake Mix , and decided that was, for sure this time, what he wanted. The cake was a pretty cool design, but I just couldn't swallow paying $4.00 for a box of cake mix. That's crazy. 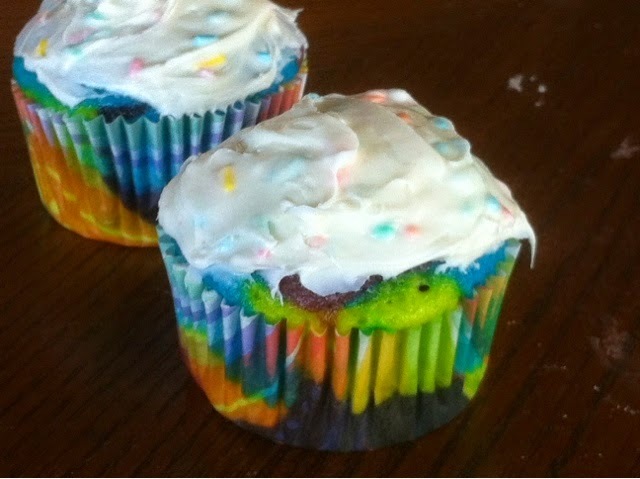 Instead, we purchase a white cake and decided to DIY our own Tie Dye Cupcakes. We started by making a white cake mix using the egg whites to keep the white color pure for dying. I'm not sure what would happen if we used a yellow cake or used the whole cake recipe on the white mix. I may give it a try sometime, but we didn't here. After the cake was mixed, we separated the batter into several different bowls. I let Mini Me play with the food coloring to dye to batter any color he wanted. He ended up making 8 different colors. We lined the cupcake tins and proceeded to start adding blobs and dots and layers of colored batter to the cupcakes. I think this was Mini Me's favorite part. We had a lot of fun mixing the different colors. Once the cupcakes were about 3/4 of the way full (we only got 18 cupcakes doing it this way), we cooked them as directed on the box mix. They turned out so cool!